Welcome to Sustainable Agriculture London – Health and Nutrition through Permanent Agriculture, which includes Regenerative Agriculture, and Agroecology techniques. The mainstay of this web site is derived from the work of Sir Albert Howard CIE., MA., etc., who spent 30 years in India researching this subject matter. This system of growing produces the most possible nutrients in food crops. No Dig technology preserves soil structure and does not destroy the natural Mycorrhiza fungi system in the soil. Mycorrhiza is the mass of fungi threads that transport nutrients from the soil into the root hairs of plants and thus makes the maximum uptake of nutrients possible. This immediately improves the nutrition of animal and man who may consume food grown in this way. The modern conundrum is to plough is good but ploughing destroys the natural Mycorrhiza fungi structure in the soil (Rodale Institute, USA) and so automatically depletes nutrition. With the HH-2 equipment you too can create this greatly increased microbial activity in your soil. It is the high level of namatodes that prevent the attacks of slugs and snails in all crop types. This work has been studied and formulated by the author of this web site, Richard Higgins, for modern day applications. Higgins has drawn together this ancient science of fertility making and that of zero till and low till technology and compressed it into the Howard-Higgins system for the 21st Century and beyond. It is a symptom of this age that people very quickly forget something that was very important only a few generations hence; coupled with the fact that the world today is driven by economic persuit rather than the persuit of pure science. In Howard’s time many communities world-wide were consuming foods grown with this ancient system of agriculture. The population s of China, Korea and Japan during the early part of the last century were found not to harbour disease, without the use of inoculations. There were virtually no cases of birth defects, disability or degenerative diseases in animal or man. These populations had built up good immune systems which were cumulative. Today degenerative diseases are on the increase and this is due to decline in agricultural knowledge and poor water quality. Write to us for an accurate quote to info@ggi.org.uk for purchasing the HH-2 with the shipping cost to your country. The HH-2 Superfast Composting system is available with other associated equipment. The units generate HH-4 fertilser/soil conditioner in 60 -90 days depending upon use. The correct application of this material once yearly can guarantee virtually pest and disease free crop production on any soil type. Please read through this web site and email us for more details. Please also see our testimonial section. We are currently manufacturing the HH-2 units in large quantities for volume price and ease of deliveries. They have been formulated over a twenty year period with the best design for generation of the correct fungi and bacteria that is the key to first class healthy top soil, or fresh humus. The concept that arose from the concept that farming is all about yield rather than about productivity began around the time of the Leibig theory from 1868. Thus Justus Von Leibig’s theory of ‘the minimum’became ever increasingly popular. The health of the population has been deteriorating gradually sine this time and now 1 in 3 have cancer. The law of return should so be practised and even more than that the law of the maximum. The more organic matter (in the right condition) that you can return to your fields will gradually have a benefit to the animals and humans that sustain themselves from it. ‘Humus the substratum of all that is living’ (King wrote in 1911) and this substance with the law of ‘return’ is not even considered today. According to a statement by Colin Tudge, the founder of the Oxford Real Farming Conference, “anything pre 1960 is not even considered by modern agriculture.” This is their greatest mistake. Every square inch is about production rather than fertility. The result being that there is now increasing crop failures and more and more pests and diseases. The agricultural systems developed by Howard were based on the Permanent Agriculture of the east. This is where the term Permaculture has derived from. The HH-2 system of horticulture and HH-1 system for agriculture have been formulated for modern day use by the author of this web site, Richard Higgins. Our demonstration Micro-farm at Well End, Hertfordshire is a living example of the Howard fertility making system and that of the ancient Chinese which has been rolled into one by Higgins for modern day use in all food growing climate zones. We are able to grow 2-3 crops a year on the same land without any fallow period even without necessarily a crop rotation. This land at the Micro-farm has not been previously cultivated for 40 years. The crops are all remarkably pest and disease free and grow to larger sizes than found in conventional or organic farming. We employ no chemicals whatsoever, nor use nets against butterfly pests, nor do we purchase nematodes for use against slugs. We have no slug or snail pests. The HHS system of agriculture and horticulture is a grand addition to all forms of horticulture, agriculture and Permaculture because it directly increases the micro-biological diversity in all soil types. The zero till aspect of the Howard-Higgins System (HHS) is a fossil free system and the low till cultivation is effected with modern equipment gravitating back to animal traction. Both these systems of farming have great potential for developing countries who are increasingly restricted by the costs of fossil fuels, machinery and the cost of chemicals. We offer on farm consultancy for scale up with our Bio Fertile Farming Consultancy. Another main factor in food production world-wide is phosphorus, without which food cannot be grown. Dr. Rosemarrin, Communications Director of the Swedish Environmental Institute comments most comprehensively on the depletion of the world’s phosphorus supplies for agriculture. This subject is again overlooked by many of the modern growers of today. This is because sustainable agriculture has been lost and many input sources are not talked about and the main source of sustainable phosphorus is never mentioned. Dr. Rosemarrin at the Swedish Environmental Institute. The system was fully approved by the Institute. At the Well End Micro-farm we are also offering a venue for teachers to teach their specialist subjects. Courses from Anthropology to Vegetarianism from Biodiesel to Yoga, all are welcome. Anything that optimises the health and longevity of all species and the planet is welcome. That’s Permaculture! The Following is a list of essential elements in Agriculture and Horticulture. While this list points out the deifficiencies in plants the elements which head each section can all be replaced with HH-4 via the HH-2 Horticultural System. Plants use phosporus to form the nucleic acids DNA and RNA and to store and transfer energy. Phosphorus promotes early plant growth and root formation through its role in the division and organization of cells. Phosphorus is essential to flowering and fruiting and to the transfer of hereditary traits. Phosphorus is adsorbed by plants as H2PO4–, HPO4-2 or PO-3, depending upon soil pH. The mobility of phosphorus in soil is low, and deficiencies are common in cool, wet soils. Phosphorus should be applied to fields and gardens before planting and should be incorporated into the soil. This is especially important for perennial crops. Application rates should be based on soil testing. Tip and marginal “burn” starting on mature leaves. Lower leaves turn yellow. Weak stalks and plants lodge easily. Small fruits or shriveled seeds. The third number on a bag of inorganic fertilizer (e.g., 20-10-20) refers to the percentage of K2O by weight. Potassium is necessary to plants for translocation of sugars and for starch formation. It is important for efficient use of water through its role in opening and closing small apertures (stomata) on the surface of leaves. Phosphorus increases plant resistance to diseases and assists in enzyme activation and photosynthesis. It also increases the size and quality of fruits and improves winter hardiness. Plants take up potassium in the form of potassium ions (K+). It is relatively immobile in soils but can leach in sandy soils. Potassium fertilizer should be incorporated into the soil at planting or before. Application rates should be based on a soil test. “Tip burn” of young leaves — celery, lettuce, cabbage. Growing point dieback. Death of growing points (terminal buds). Root tips are also affected. Premature shedding of blossoms and buds. Water-soaked, discolored areas on fruits — blossom-end rot of tomatoes, peppers and melons; bitter pit or cork spot of apples and pears. Calcium provides a building block (calcium pectate) for cell walls and membranes and must be present for the formation of new cells. It is a constituent of important plant carbohydrates, such as starch and cellulose. Calcium promotes plant vigor and rigidity and is important to proper root and stem growth. Plants adsorb calcium in the form of the calcium ion (Ca+). Calcium needs can be only determined by soil test. In most cases calcium requirements are met by liming the soil. Potatoes are an exception; use gypsum (calcium sulfate) on potatoes to avoid scab disease if calcium is needed. Gypsum provides calcium to the soil but does not raise the pH level of the soil. Keeping pH low helps prevent growth of the bacteria that cause scab disease. Interveinal chlorosis (yellowing) of older leaves. Curling of leaves upward along margins. Marginal yellowing with green “Christmas tree” area along midrib. Generally supplied when soils are limed with dolomitic lime. Magnesium deficiencies are most likely to occur on acid, sandy soils. Soil tests can be used to determine Mg needs. Mg deficiency can be induced by high K applications. Magnesium is a component of the chlorophyll molecule and is therefore essential for photosynthesis. Magnesium serves as an activator for many plant enzymes required for sugar metabolism and movement and for growth processes. Plants take up magnesium as the Mg+2 ion. Young leaves are light green to yellowish in color. In some plants, older tissues are also affected. Sulfur is a constituent of three amino acids (cystine, methionine and cysteine) that play an essential role in protein synthesis. Sulfur is present in oil compounds responsible for characteristic odors of plants such as garlic and onion. It is also essential for nodule formation on legumes. Plants take up sulfur in the form of sulfate (SO4-2) ions. Sulfur can also be adsorbed from the air through leaves in areas where the atmosphere has been enriched with sulfur compounds from industrial wastes. Sulfur is susceptible to leaching, and sulfur deficiencies can occur in sandy soils low in organic matter. Sulfur needs can be only determined by a soil test. Decreasing in stem length and a rosetting of terminal leaves. Dieback of twigs after the first year. Mottled leaves and interveinal chlorosis. Chelating agents EDTA, HEEDTA and NTA help make certain nutrients more available to plants. Zinc is an essential component of several enzymes in plants. It controls the synthesis of indoleacetic acid, an important plant growth regulator, and it is involved in the production of chlorophyll and protein. Zinc is taken up by plants as the zinc ion (Zn+2). Zinc deficiencies are more likely to occur in sandy soils that are low in organic matter. High soil pH, as in high-lime soils, the solubility of zinc decreases and it becomes less available. Zinc and phosphorus have antagonistic effects in the soil. Therefore zinc also becomes available in soils that are high in phosphorus. Wet and cold soil conditions can cause zinc deficiency because of slow root growth and slow release of zinc from organic matter. Interveinal chlorosis of young leaves. Veins remain green except in severe cases. In severe cases, death of limbs or plants. Iron is taken up by plants as ferrous ion (Fe+2). Iron is required for the formation of chlorophyll in plant cells. It serves as an activator for biochemical processes such as respiration, photosynthesis and symbiotic nitrogen fixation. Turf, ornamentals and certain trees are especially susceptible to iron deficiency, although in general, lack of iron in the soil is not a problem. Symptoms of iron deficiency can occur on soils with pH greater than 7.0. Specific needs for iron can be determined by soil test, tissue test and visual symptoms. Interveinal chlorosis of young leaves. Gradation of pale green color with darker color next to veins. No sharp distinction between veins and interveinal areas as with iron deficiency. Manganese serves as an activator for enzymes in plant growth processes, and it assists iron in chlorophyll formation. Plants obtain this nutrient from the soil in the form of manganous ion (Mn+2). Manganese deficiency in soils is not common but can occur in sandy soils with a pH of 8. Soil pH is a good indicator of manganese availability, which can increase to toxic levels in highly acidic soils (pH less than 4.5). Crops most responsive to manganese are onions, beans, potato, spinach, tomato, peas, raspberries, strawberries, apples and grapes. Dieback of terminal shoots in trees. Wilting and eventual death of leaf tips. Copper is an activator of several enzymes in plants. It may play a role in production of vitamin A. Deficiency interferes with protein synthesis. Copper deficiencies are not common in soils. Plants take up copper from the soil in the form of cuprous (Cu+) or cupric (Cu+2) ions. Crops most responsive to copper are carrots, lettuce, onions and spinach. Death of terminal buds, causing lateral buds to develop and producing a “witches broom” effect. Thickened, curled, wilted and chlorotic leaves. Soft or necrotic spots in fruit or tubers. Reduced flowering or improper pollination. Boron regulates the metabolism of carbohydrates in plants. It is essential for the process by which meristem cells (cells that divide) differentiate to form specific tissues. With boron deficiency, plant cells may continue to divide, but structural components are not differentiated. Boron is taken up by plants as the borate ion (BO3–). Plants differ in their boron needs. Plants with high boron requirements are cauliflower, broccoli, turnip, brussels sprouts, apples, celery and alfalfa. Boron can be limiting on sandy soils low in organic matter. Do not overapply, because boron toxicity can occur ( e.g., beans). Soil testing for boron can predict fertilizer requirement. Stunting and lack of vigor. Similar to nitrogen deficiency due to the key role of molybdenum in nitrogen use by plants. Marginal scorching and cupping or rolling of leaves. Molybdenum is taken up by plants as molybdate ions (MoO4–). Molybdenum is an essential micronutrient that enables plants to make use of nitrogen. Without molybdenum, plants cannot transform nitrate nitrogen to amino acids and legumes cannot fix atmospheric nitrogen. Molybdenum deficiency can occur in acidic, sandy soils. Liming the soil to pH 6 will correct the problem. Soil applications, foliar applications or coating seed with molybdenum are also effective. Cauliflower is the main vegetable crop sensitive to low levels of molybdenum in the soil. Wilting followed by chlorosis (yellowing). Excessive branching of lateral roots. Chlorosis and necrosis (tissue death) in tomatoes and barley. Chlorine is required in photosynthetic reactions. Deficiency of chlorine in soils is rare because of its universal presence in nature. Plants take up chlorine as chloride ion (Cl–). Because nickel deficiency does not occur in soils, there are no reported sources of nickel fertilizer for soil. Nickel is taken up by plants as Ni+2. Nickel is a component of the enzyme urease, which is needed to prevent toxic accumulations of urea, a product of nitrogen metabolism in plants. Nickel is thought to participate in nitrogen metabolism of legumes during the reproductive phase of growth. It is also essential for seed development. High levels of nickel in the soil can induce zinc or iron deficiency by competition between these elements in plant uptake. The soil test is an excellent gauge of soil fertility. It is an inexpensive way to maintain good plant health and maximum productivity without polluting the environment by overapplication of nutrients. Soil fertility fluctuates throughout the growing season each year. The quantity and availability of mineral nutrients are altered by the addition of fertilizers, manure, compost, mulch, lime or sulfur and by leaching. Furthermore, large quantities of mineral nutrients are removed from soils as a result of plant growth and development and the harvesting of crops. 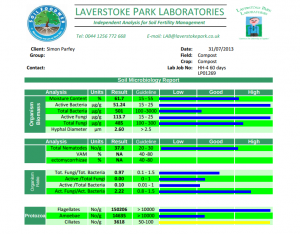 A soil test will determine the current fertility status. It also provides the information needed to maintain optimum fertility year after year. Some plants grow well over a wide range of soil pH, while others grow best within a narrow range of pH. Most turf grasses, flowers, ornamental shrubs, vegetables and fruits grow best in slightly acid soils (pH 6.1 to 6.9). Plants such as rhododendron, azalea, pieris, mountain laurel and blueberries require a more acidic soil to grow well. A soil test is the only precise way to determine whether the soil is acidic, neutral or alkaline. A soil test takes the guesswork out of fertilization and is extremely cost effective. It not only eliminates the expense of unnecessary fertilizers but also eliminates overuse of fertilizers and helps to protect the environment. When is the best time for a soil test? Soil samples can be taken in the spring or fall for established sites. For new sites, soil samples can be taken anytime when the soil is workable. Most people conduct their soil tests in the spring. However, fall is a preferred time to take soil tests if one suspects a soil pH problem and wants to avoid the spring rush. Fall soil testing will allow you ample time to apply lime to raise the soil pH. Sulfur should be applied in the spring if the soil pH needs to be lowered. How to take a soil sample? Taking a representative sample is important in soil testing. Use a trowel, spade and sampling tube/core samplers. For garden and lawn establishment or renovation, take a 6-inch sample. For established lawns, take a 3- to 4-inch sample after removing thatch. Sample from five or more scattered/random spots in the test area. A soil sample is best taken with a soil probe or an auger. Samples should be collected in a clean plastic pail or box. These tools help ensure an equal amount of soil to a definite depth at the sampling site. However, a spade, knife, or trowel can also be used to take thin slices or sections of soil. Push the tip of a spade deep into the soil and then cut a 1/2-inch to 1-inch slice of soil from the back of the hole. Be sure the slice goes 6 inches deep and is fairly even in width and thickness. Place this sample in the pail. Repeat five or six times at different spots over your garden. Thoroughly mix the soil slices in the pail. After mixing thoroughly, take out about 1-1/2 cup of soil and mail or, preferably, take it to your University Extension center. You can also mail or deliver it to the MU Soil and Plant Testing Laboratory in Columbia or at the Delta Research Center in Portageville. It is important that you fill out the soil sample information form (Figure 5) completely and submit it with your sample. By indicating on the form the crops you wish to grow, you can get specific recommendations. Soil should be tested every two to three years. In sandy soils, where rainfall and irrigation rates are high, samples should be taken annually. What tests should be run? In general a regular fertility test is sufficient. This includes measurement of pH, neutralizable acidity (NA), phosphorus, potassium, calcium, magnesium, organic matter (OM) and cation exchange capacity (CEC). What do the test result numbers mean? Some labs report soil test values as amounts of available plant nutrients, and others report extractable nutrients that will become available to the plants (Figure 6). Fertilizer rates are given in pounds of actual nutrient (as distinct from pounds of fertilizer) to be applied per 1,000 square feet. 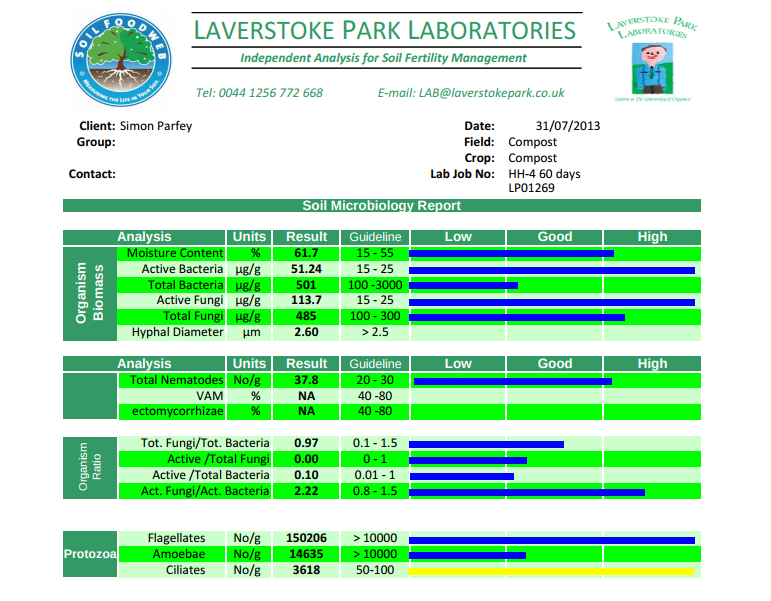 The MP555, Soil Sample Information for Lawn and Garden form for MU soil testing laboratories is available online. Figure 6. A soil test report from MU Soil and Plant Testing Laboratory shows the results of soil analysis and recommends fertilizer and limestone needs to improve plant health and productivity. All fertilizer recommendations given in a soil test report are based on the amount of nutrient (N, P2O5, K2O) to apply for a given area. Lawn and garden recommendations are given in pounds per 1000 sq. ft. From the given recommendations it is necessary to select an appropriate fertilizer grade and determine how much of this fertilizer to apply to the garden area. Numbers on fertilizer bags indicate the exact percentages of nutrients by weight: 100 lb of 5-10-10 fertilizer contains 5 lb of nitrogen (N), 10 lb of phosphate (P2O5), and 10 lb of potash (K2O). Because it is difficult to achieve the exact amount of all recommended nutrients from the garden fertilizer blends available in the market, it is important to match the nitrogen requirement. A soil test recommendation for your vegetable garden calls for 2 lb of N/1000 sq. ft, 0 lb of P2O5 /1000 sq. ft and 1 lb of K2O. The garden is 40 ft by 10 ft. Calculate the area to be fertilized. Multiplying length by width, the area of the garden is 40 x 10 = 400 sq. ft. Select the fertilizer to be used. Match the ratio of nutrients recommended to the fertilizer grades available. The N-P-K nutrient ratio based on the soil test is 2-0-1. Ideally, a fertilizer such as 10-0-5 or 20-0-10 or 30-0-15 should be selected. At the local garden store, fertilizer bags marked 20-10-10, 27-3-3 and 25-0-12 are available. The one marked 25-0-12 best matches the ratio of 2-0-1 recommended by soil test. Determine the fertilizer amount to apply: Divide the recommended amount of nutrient by the percentage of the nutrient (on a decimal basis) in the fertilizer. 2 lb of N/1000 sq. ft x 400 sq. ft/ garden = 0.8 lb of N per 400 sq. ft garden. 100 lb of the 25-0-12 garden fertilizer blend will have 25 lb of N and 12 lb of K2O. 100 lb for fertilizer blend /25 lb of N x 0.8 lb of N = 3.2 lb of the fertilizer blend required to provide the N requirement of the garden. Since the fertilizer blend ratio is almost the same as the recommended ratio, it will provide the required amount of K (1.6 lb of K2O) to the garden. The weight of 2 cups of dry fertilizer is approximately 1 pound. Therefore to meet the garden fertilizer recommendation, you will need about 6 cups of the fertilizer blend (25-0-12) material for the 400 sq. ft area. Recommended application rate for various granular fertilizers to apply one pound of nitrogen. Well End Permaculture and various regenerative practices (RegenAg) have been brought together to facilitate those in the persuit of sustainable practices that produce highly nutritious foods. The processes involved can help reduce the burden on the Earth, of excessive mining for elements for agriculture that are found and supplied from the surface of the earth. This will increase labour opportunities and reduce the dependence on fossil fuels and clean up a lot of pollution. This will make life for all of us a lot less expensive and more sustainable. More food will be produced per acre and of a far higher quality. This will improve the health of both animals and man. By pulling together the works of Sir Albert Howard, Sir Robert McCarrison, Dr. F.H. King, Lady Eve Balfour, Friend Sykes, Newman Turner, A. Guest and other leading proponents of certain organic systems along with the techniques of ‘zero till’ and ‘low till’ agriculture, Sustainable Agriculture London has been formed. Working in conjunction with Permaculture principles the results (and the health results) obtained have been astounding. DONATE – we appreciate donations large or small to help forward our cause. We are now getting the HH-2 Horticultural system into Africa.